Selection Original Pinot Noir captures the essence of this great wine time after time. 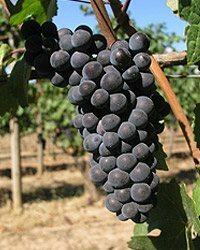 Pinot Noir is one of the most elusive and delicious of all red wines. Burgundy, the world's most famous Pinot Noir, is classified by the French as a 'feminine' wine, and they declare it the Queen of Reds - with good reason. Delicate rather than burly, yet intensely perfumed with raspberry and violet aromas Pinot Noir can be almost overwhelming to the senses, layering on red fruit characteristics, with red cherry, strawberry, and raspberry. New Zealand's Marlborough region, at the top of the South Island is an ideal growing area for Pinot Noir: it has the sunniest, driest climate in all of New Zealand, with the brilliant sunshine moderated by cool breezes from the Pacific Ocean. This ensures that the grapes ripen slowly and perfectly. New Zealand Pinot Noir offers amazingly lush flavours and an extraordinarily long finish, with silky tannins gripping the palate like velvet and a final, elusive aftertaste of spice and toasty vanilla. Excellent when paired with Boeuf Bourguignon, game, turkey, salmon, and cassoulet.